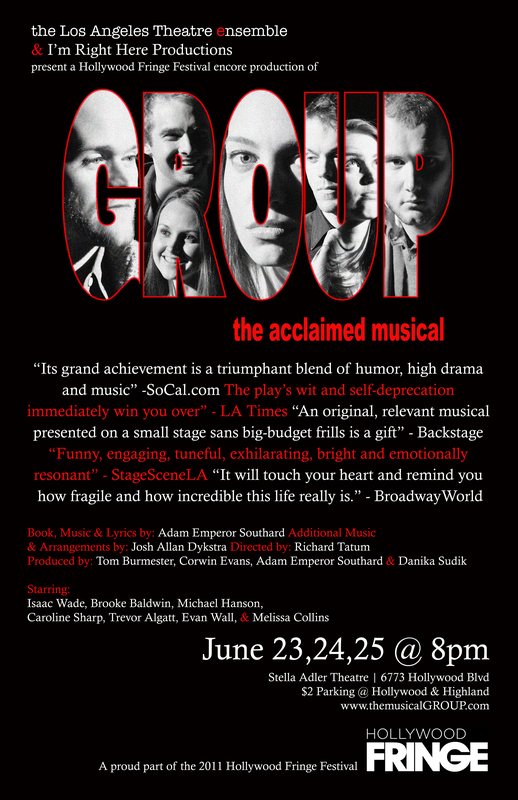 THE STELLA ADLER THEATRE – JUNE 23, 24, 25 AT 8 P.M.
Hollywood, CA – The Los Angeles Theatre Ensemble & I’m Right Here Productions are proud to present three encore performances of the musical Group during this year’s Hollywood Fringe Festival at the prestigious Stella Adler Theatre. Group premiered to critical acclaim this past January at the Powerhouse Theatre. The original cast is excited to perform in front of Hollywood audiences for the first time. The three encore performances are at 8p.m. on June 23rd, 24th & 25th at the Stella Adler Theatre at 6773 Hollywood Boulevard. Tickets are available for $12 both at the door and online on the Hollywood Fringe official website: www.hollywoodfringe.org/projects/452 Parking with validation from the theatre is only $2 at the Hollywood and Highland structure.